Officials scrubbed the launch of an Antares rocket with fresh supplies for the International Space Station on Monday after a boat sailed into restricted waters off Virginia’s Eastern Shore, violating safety rules for a widely-anticipated launch that was expected to be visible to millions along the U.S. East Coast. 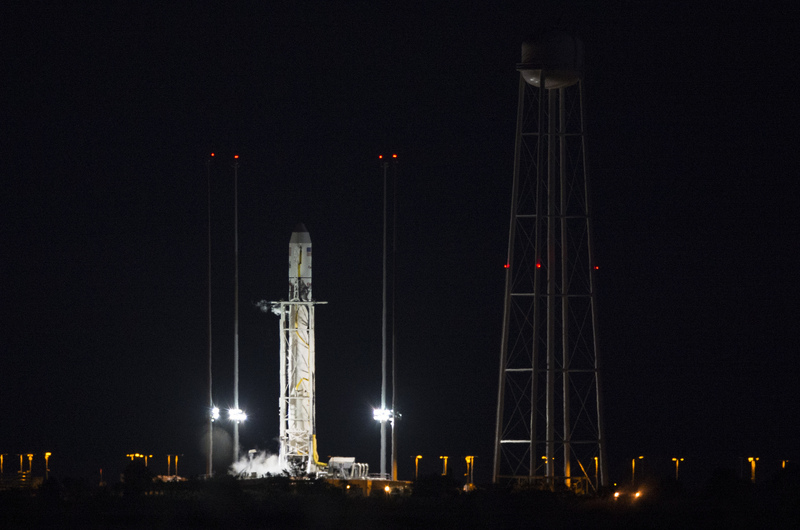 The 139-foot-tall rocket was fueled and checked out for liftoff at 6:45 p.m. EDT (2245 GMT) with a Cygnus cargo craft carrying nearly 4,900 pounds of experiments, tools, and provisions for the space station’s six-person crew. But the launch team halted the countdown at T-minus 12 minutes after a boat strayed into downrange waters southeast of the Antares launch pad at Wallops Island, Va.
After briefly resuming the countdown in hopes of launching 10 minutes late at 6:55 p.m. EDT (2255 GMT), Orbital Sciences Corp. scrubbed the flight and rescheduled the launch for Tuesday. Officials said they called off the launch in the interests of public safety. The rocket’s flight path would have taken it over the boat, potentially putting the vessel’s passengers in jeopardy if something went wrong with the launch. NASA’s Wallops Flight Facility runs the Antares launch range, and a notice to mariners released before Monday’s scheduled launch outlined two danger zones downrange from the Virginia coast. The notice says fines and arrest authority are permissible by the U.S. Coast Guard and the Virginia Marine Police for boaters in the area. 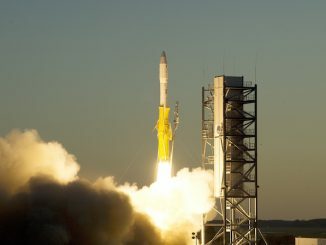 Boats violating restricted rocket safety zones periodically cause launch delays, but missions with long launch windows give vessels more time to vacate restricted areas. 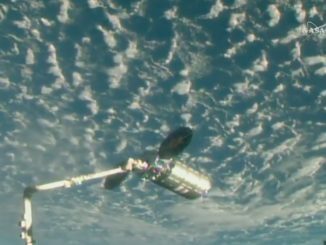 Monday’s launch window was only 10 minutes long because of a narrow opportunity for the spacecraft to reach the space station’s orbit. An Atlas rocket launch from Cape Canaveral — a spaceport run by the U.S. Air Force — was scrubbed in 2000 after boats strayed into restricted waters during a fishing tournament scheduled the same day. Numerous other launches are kept on the ground until planes and boats get out of the way of the rocket’s trajectory. 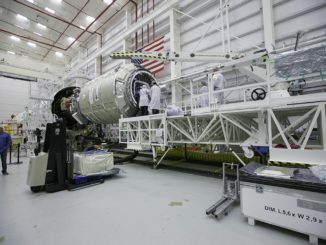 The Antares launch operates under a commercial license issued by Federal Aviation Administration, which oversees the flight to ensure public safety. Tuesday’s launch time is set for 6:22 p.m. EDT (2222 GMT), about 15 minutes after sunset at Wallops Island, Va. The rocket’s ascent into orbit could be visible from the Carolinas to New England. The Antares should be illuminated by sunlight as it flies into the upper atmosphere, potentially creating a dazzling sky show as the rocket’s exhaust plume is lit up like a brilliant bright cloud. The one-day launch delay will not affect the mission’s Cygnus supply ship’s arrival at the space station, which is still expected Nov. 2.